This guide will show how to quickly setup a single email address to be used with all of your stores. So if you have 10 stores running, you don't need to setup 10 different emails for each domain. Once you use this catch all feature, any emails sent to your domains will be forward to a single email account which can be gmail, yahoo or any email you use. Once the catch all email is set for your domain. You can use any keyword you want for your email and it will all get redirected to the single email you set. 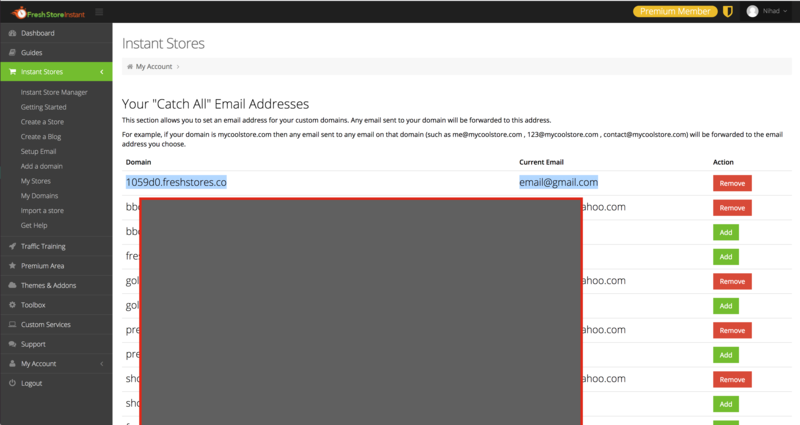 This section allows you to set an email address for your custom domains. Any email sent to your domain will be forwarded to this address. For example, if your domain is mycoolstore.com then any email sent to any email on that domain (such as me@mycoolstore.com , 123@mycoolstore.com , contact@mycoolstore.com) will be forwarded to the email address you choose. Step 2- On this page you will see any active FSI stores you have setup and for all of those domains you can setup a email to catch any emails sent to those domains. 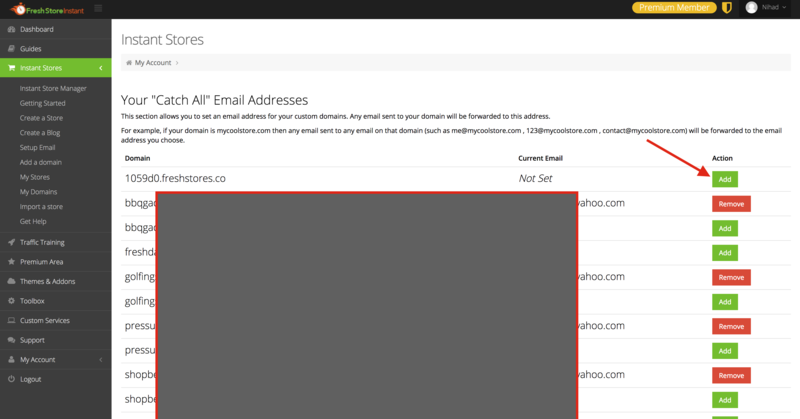 Click on the ADD button for each of the domains to set the email. Once setup, you can do a test by sending a email to your stores domain using any name for the email name and it will get forwarded to the email you set on your FSI account.